Trust us to restore your vehicle and get you back on the road in no time. Well the good news is that you can stop worrying and have your vehicle towed, be it a Dodge, Jeep, Chrysler or any other make of car, right here to Sedalia’s Bryant Motors Collision Center. 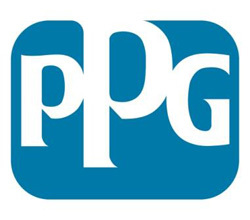 We take pride in providing the best quality and customer service around! We’re so happy when our community chooses us for automotive repair, and we’d like to thank all of our existing loyal customers – and the many new customers we meet every day – for choosing us. 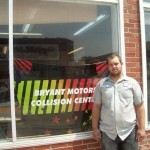 Your car is in the right hands with the team at Bryant Motor’s Collision Center, located in downtown Sedalia. Call Sedalia’s best auto body repair shop, or stop by today! Our professional car collision repair team is ready and certified to take on even the most impossible seeming bodywork jobs. 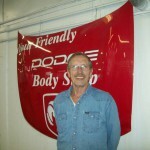 John has 57 + years experience in collision repair! 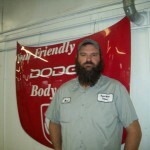 Chris attended Eldon Tech Collision Repair Vocational School. Before you bring your crashed car to our auto body technicians, make sure that you’ve talked with your insurance adjuster to understand what repairs your insurance will cover. Once your car or truck is brought to the shop, our body repair technicians will give you an estimate on how much the repairs will cost. 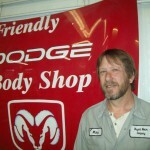 For Dodge, Chrysler and Jeep models, we can get factory-certified auto parts for your vehicle’s repairs. All of our auto body shop work is covered by a lifetime warranty on workmanship and refinishing. What’s more, we take not just your car’s looks seriously, but your safety as well. We’ll make sure alignment, electrical systems, brake systems, suspension and drive train are all working properly after collision repair work is complete. Why should you trust us? 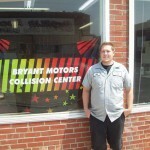 Well, Bryant Motors has been doing business in the Central Missouri area for over 80 years now. We’ve built our reputation on quality service, be it in our car sales, service or repair department. 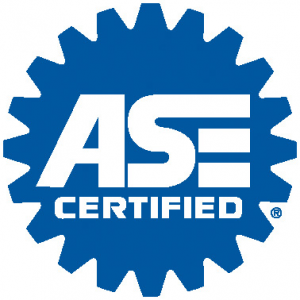 We take our job seriously, which is why our Collision Center technicians are certified to do the job. Our current collision repair technicians have collectively over 130 years of experience in automotive body work! 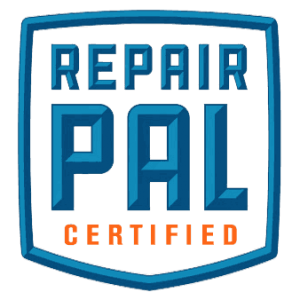 What’s more, our shop is RepairPal Certified in Auto Body Repair. RepairPal certifies the highest performing body shops across the countries that provide quality service and fair prices to their customers. While we specialize in repairing the latest models of Dodge, Jeep and Chrysler, we can repair ALL makes and models that get towed to our bay – be it a Ford, Mazda, Toyota or other manufacturer. At Bryant Motors, we’re here for our customers – whether they’re in need of serious collision repairs or routine maintenance for their car, or if they need to start shopping after a car is officially totaled. Our factory-trained auto repair technicians and their high quality work has earned the loyalty of our customers in Sedalia, Warrensburg, Jefferson City, Marshall, Clinton, Boonville and the rest of central Missouri.